We have here a record containing a lot of similar qualities to the A-side of the release yet it’s a song that is decidedly more typical in structure and therefore it stands to reason this might more accessible for the rock audience. But what? Does that mean it’s less experimental, less ambitious and thus less rewarding? Or does it mean that it’s merely not as noteworthy and thus bound to be overlooked, perhaps unfairly? Or does that three letter word implying there’s something more to the story just mean you’ll need to read the rest of the review to find out what sets this side apart from its flip as we pick through the carcass of yet another long forgotten record discarded at the time by the public and never revisited by anyone but a few curious fools in the years since? I know you know the answer to this one, so read on. Artists tend to go through phases in their careers where they hit upon something slightly different than they’d tackled before and find it intriguing enough to explore in a multitude of ways before tiring of it – or finding the audience tires of it – and moving on. It could be the addition or a new instrument into the arrangements, or a novel songwriting perspective, or perhaps they’ve found a different way to use their voice and like a kid with a brand new toy they want to show it off. 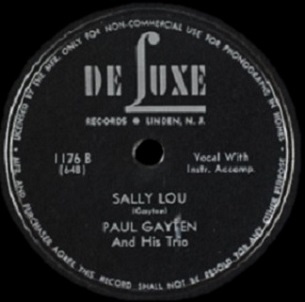 Paul Gayten does a little of all three here on Sally Lou which connects it to the other side of this record, the intriguing quasi-talking blues number, Stop. But just as that song didn’t strictly fall within the established talking blues parameter – it had a bit too much singing and far too much musical variation for that – today’s song ventures even further away from that prototype, yet retains a few noticeable traits that tie it in with it all the same. You can understand his interest in pursuing an idea that was percolating in his mind, even picture him being consumed by trying to figure out just how to make it work and trying out different tactics to see what was most effective. 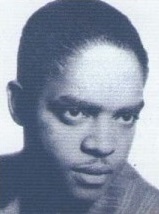 He’d taken the existing basic formula of the already established talking blues motif – spoken rhyming couplets with a non-rhyming punchline – and then modified it considerably by not sticking to the simple repetitive accompaniment and adding a fully sung chorus and an extended instrumental break. That allowed him to test out the idea of delivering part of the song in a spoken word recitation, something he does in a more limited way on this side as well. It also gave him a song with an unusual musical configuration with which to experiment with a different drum pattern, which he expands on here by inserting this approach into what is otherwise a more standard track. But if it was the uniqueness of Stop which allowed it to stand out as much as it did, when you then cut back on those more radical structural differences, yet at the same time carry over a few of the more oddball touches, can that record hold its own, or will Sally Lou be at risk of being passed over altogether? They start off strong with an intro that features interlocking drums, guitar and piano, all of which lays down a very intoxicating feel, but sadly they don’t keep that up. The backing is at its best when the drums are the primary focus and the guitar only delivers an accent which is then responded to by the piano, each stepping back out of the spotlight right away to hand things back to those drums. But as mesmerizing as that sounds in 1948 it’s almost TOO rhythmic to be entrusted to carry an entire song and so midway through the introduction the drums dutifully hand the baton to Gayten’s piano to establish a melodic thread to pull which is where it goes from really good to fairly ordinary. Songs that start off with their best attribute often spend the rest of the record handing back the plaudits they just earned, making you think less of what follows simply because you thought so highly of what they offered at the beginning. Much like a boxer who storms out of his corner at the bell for Round One and unleashes a flurry of punches, they quickly tire out and are in danger of not just losing the round when all is said and done, but the fight as well if they’re not careful. Here Gayten stays on his feet for sure but when he kicks off his vocals with that same semi-shouted, half-spoken, half-chanted ”Hey now!, which had seemed so fresh and vibrant on the A-side your hopes fall even further. There’s no way around it, it gives you too much of a sense of déjà vu if you listened to the other side already and so when he finally jumps into the story of Sally Lou you find that all of his magic tricks have been used up already. For starters the story is nothing special. In fact it seems related to Stop in some way, like a prelude to that song or more like the increasingly desperate aftermath once the girl he’s already propositioned ignores his advances. This time around he’s openly pining for a girl who’s clearly not interested in him which is a little awkward to hear. Usually singers want to get you on their side in some way, to forge a connection with the story, something you can relate to, or at worst maybe sympathize with their plight. But when Gayten tosses aside his self-respect to fawn over someone who isn’t even glancing back at him by the sound of it we just get uncomfortable with the mawkish display. He’s not breaking down crying in the midst of his plea at least, but he’s casting himself in such a negative light because he’s totally subservient to this girl. That contrasts with his more casually confident demeanor he showed on Stop, where he may have been seeking the same reprieve from the girl in question but he wasn’t going to debase himself by asking. Instead he projected a take it or leave it attitude and you felt reasonably sure he wasn’t going to be sending her flowers and candy in hopes of winning her over. Not so with Sally Lou who can only be thankful voicemail didn’t exist in 1948 or it’d be overflowing with messages by Paul telling her how he can’t live without her. That’s not a pretty picture to paint, no matter the era. All of which is unfortunate because the rest of this is actually pretty good, redeeming itself with workmanlike precision. The music maintains a subtly driving momentum that really picks up during the instrumental break which may be carried by the piano but features some nasty guitar notes tossed in like flying shrapnel to keep you on your toes. For such a small band they manage to inject the arrangement with plenty of muscle in such limited space. The label says Trio and that obviously isn’t counting Gayten himself, as we hear a bassist along with the drummer, who is still keeping steady time, and Jack Scott’s snarling guitar, and you get a sense of why everybody in New Orleans always said that Gayten had the best band around, regardless of its members, which says a lot about his ability to showcase them in the best light. The same can be said about Gayten’s singing, for while what he is saying is all wrong if he actually wants this girl to reconsider, his voice itself contains some interesting textures and has real presence in the arrangement. He’s got a decent tone, one that has definite regional attributes that are unmistakable even if they’re hard to describe, but if you’ve listened to enough New Orleans singers of this era you’ll have no trouble recognizing those familiar vocal traits and guessing where he’s from. Cousin Joe, Dave Bartholomew, Smiley Lewis… all of them shared this strange metallic accent that gives their vocal chords a bit of harsher surface that reflects sound rather than absorbs it in a way. It’s an engaging voice, let’s put it that way, but for it to be truly effective he has to put it to better use than the mid-song spoken interlude he offers up wherein he tells poor Sally, who must be hiding under the bed by now, that even though she apparently won’t have anything to do with him, she’s still “his” girl and has been for twenty years. I’m sure that’s news to Sally Lou and considering Gayten was just in his mid-to-late twenties it means this poor girl has been dodging Paul’s advances since grade school. It makes you sort of wish she had an older brother who could pound some sense into the far too persistent singer. But alas, she’s going to be resigned to ducking into ladies rooms, or jumping onto moving streetcars to try and elude him… at least until she marries some no-good brute or a drunken sailor in port for the weekend just to put up a sturdy barrier between her and her unwelcome suitor. Though the bulk of the song itself is a good offering this would’ve been better received had they held it back for his next release, thereby distancing it from the related, but appreciably better, song on the top side. Paired together as they are you can’t help but make comparisons between them and when a lot of the components they use are close in so many ways, but the differences in how they’re presented all favor one side over the other, it should come as no surprise that the other side is going to suffer. The side that suffers in this case is Sally Lou. Yet in spite of its shortcomings in relation to the better side of the record, when this is focused on in isolation, or thrown into a mix of other songs by other artists released during the spring of ’48, it will hold its own and be a fairly enjoyable, if somewhat nonessential, listening experience. Even the repetition shown here doesn’t speak ill of Gayten, who needed to figure out what methods worked and what needed refining or jettisoning altogether. The realities of recording for a small label at the time meant those experiments weren’t going to be put on the shelf gathering dust, or thrown in the trash, but would be released in the hopes that one of them – ANY of them – sold. They just had no idea what side that might be. In this case it wasn’t either side, but both of them show Gayten striving to be something more than just an artist simply churning out what was expected of him, taking no risks and having no ambition. If he needed a couple of test runs to see what creative ideas of his had legs, so be it. If all of those endeavors were going to be offered up for public consumption together, well… what can you do? Leave a reply on "Paul Gayten: “Sally Lou”"